The beard has made a strong comeback in recent years. I think every single Major League Baseball player has one, and James Harden has enough beard himself for every NBA player. And to solidify my point, I have one too. So the Dollar Beard Club certainly sound appealing to me. I checked out the website, which is highlighted by a testosterone-laden, continent-hopping video which explains why you need to join the club. I liked it. What is Dollar Beard Club? 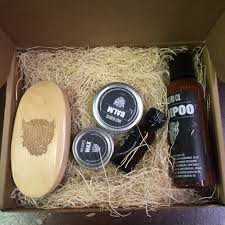 The site advertises that Dollar Beard Club offers oils, balms, waxes, growth accelerators, beard gear and apparel, and offers benefits such as beard growth like you’ve never experienced, the convenience of products delivered right to your door, and big savings. The Dollar Beard Club site also notes that you can change or end your subscription at any time, no hidden fees, and flat rate shipping. I always thought that growing a beard was the easy way out because, well, you don’t have to shave. But what I’ve learned is that it’s actually more difficult to maintain a beard. Keeping it healthy, keeping it groomed. All stuff that takes time and requires the right products. As such, I decided to give Dollar Beard Club a try. There is a $1 subscription level, but it only gets you a small bottle of beard oil (0.5 oz. ), which happens to be the Dollar Beard Club’s main product. Add 2 oz. of their original beard oil... $4 per month. Balm? $7 per month. 8 oz. Shampoo? $17 per month. So on and so forth, you get the idea. Chances are, if you have a beard, and you’re going to join Dollar Beard Club, you’re going to spend way more than $1 per month. I decided to give it a shot, and I started with the Uncut Beard Oil and Beard Shampoo. The oil does act as a moisturizer, and it is an oil, so anything that touches your beard throughout the day will get a bit greasy. Be advised, and apply with caution. Did I mention I loved the way it smells? Next was the shampoo, which is important for a beard, especially one coated with oils. If you don’t wash out those oils, they will collect in your beard, then dry out, leaving something like six-day-old pasta hanging off your face. Back to the shampoo… The Uncut Beard Shampoo provides two things guys want from a beard shampoo: a soft beard, and a clean beard. It also smells nice (hey, I like the way the beard oil smells), don't worry, the smell washes out quickly, and won’t interfere with the ferocious bouquet of the Uncut Beard Oil. After two weeks, my beard was looking and smelling great. Combine that with the flexible pricing and product options, and I would recommend Dollar Beard Club to anybody guy who sports and level of beard. Aside from the awesome products, the marketing these guys do just make me happy. If you have a beard, www.dollarbeardclub.com is an absolute must.